Know of an event that we should be part of? Contact Us and let us know about it! Thanks. Raffle Prizes (including FREE Grooming Services and Gift Certificates), free animal food samples and treat samples, and more. Come down and meet your local reptile rescue, JnW Reptile Rescue, along with some of their critter friends. Learn more about reptiles, and amphibians. The Vallejo Admirals will auctioning off their offering to Barkitecture! Hope to see you there at Wilson Park to celebrate animals, AND root for our hometown team Admirals! Come down and meet your local reptile rescue, JnW Reptile Rescue (Joe & Wendy), along with some of their critter friends. Learn more about reptiles, and amphibians, and find special offers on their food & supplies. You'll also have an opportunity to check out some animals that are available for adoption! Hope to see you there. LOOK FOR THE BIG ALLIGATOR! *Reptile Day & Adoption is a reoccurring event that normally takes place on the 3rd or 4th Saturday of each month. On occasion, the event may be held on a different day so please check in with us to be sure. Thanks! This event will start back up again in Spring '17. Calling all Solano County Backyard Chicken Keepers! Visit www.BeniciaCommunityGardens.org for more info. Visit www.VisionsOfTheWild.org for more info. Please join us for our second annual BARK FOR LIFE in American Canyon! Parking is limited, carpooling or walking is encouraged. Bark for Life is a canine event to fight cancer. Similar to Relay for Life, dogs and their owners will walk around the track as a symbolic gesture to represent the path a cancer patient takes. 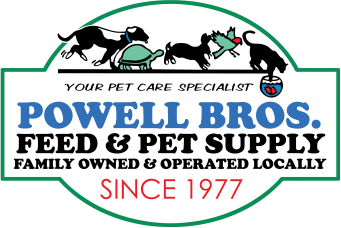 Powell Bros. Feed will be hosting the raffle at the event. Be sure to check us out and all the other sponsor booths at Bark for Life. Come on out for our pets on parade as we fight back against cancer! All funds go to the American Cancer Society, Napa County Unit. If you wish to attend and have questions, or want to become a sponsor, visit www.RelayForLife.org or call 1.800.227.2345. Thank you!